It's a futuristic building, maybe some kind of spaceship harbor, built into a huge rock and surrounded by other mountains. I spent quite some time creating an environment outside the actual fighting area to not give the player this feeling of just being caught in a small "fragging-box" with nothing around it. 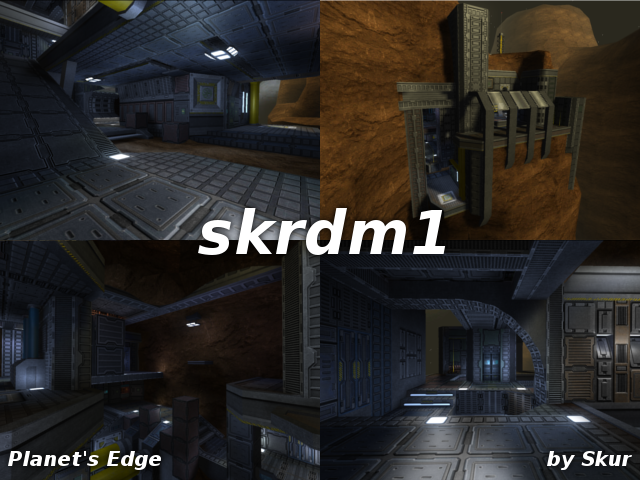 skrdm1 was originally meant to be just a duel map, but since I like duels where you also have a chance to escape from your enemy and its not all about aiming, i made it a little larger than the usual 1 on 1 maps. If you are playing in insta or prefer "faster" games, it can be played with up to 4 people (and also in capture or even hold). The screenshot looks good and shows enough to see what the map actually offers. Also the packaging is excellent, I like the clean readme-file which you've included. The theme comes through pretty good. It's obviously a space-map which the details and texturing show off very well. The texturing is pretty good. There still are some flaws at certain places. You did a good job attempting to make the trak5-textures a little more dirty, but it's not really coming through. What about adding some more geometrical heaps instead of only texture blendments? The geometry is fine. It's light-weight while looking solid. However, the geometrical dirt which you've putted in corners is containing a geometry error. Also a triangle in the mountains (seen from the YA) should be faced differently. The lighting still has some issues. There are several places which aren't containing light-source while light-entities clearly exist. The map seems to contain plenty of details. This always is the problem with the trak5 texture set, because it's not providing a lot of contrast (even the textures contain lots of details). As I already stated, some geometry heaps of dust or dirt would make it really dirty. The clipping is excellent, nothing to say about that. Edit: Clip the mountains above that ridge. It makes you being able to wallhack trough geometry of the map. A video of this can be obtained right here (the original demo can be taken here). The amount of playerstarts could be way more. 11 Playerstarts isn't a very decent number for such size of map (like you could add another playerstart near the other jumppad which launches you to the HB. A playerstart near the teleport wouldn't hurt either). Despite that, the amount of pickups is good. The map looks and plays good, but it still has a few points which could be better. I'd give it a solid 8/10 so far, reaching to 9/10. First of all, thanks for taking the time to check out my map and write a contructive comment! 1. "What about adding some more geometrical heaps..."
Yea, I kind of rushed adding the last details, but when looking at it now I agree with you that it still looks a little too clean. 2. "the geometrical dirt which you've put in corners is containing a geometry error"
3. "Also a triangle in the mountains (seen from the YA) should be faced differently." 4. "There are several places which aren't containing light-source while light-entities clearly exist." Mhmm, didn't find any.. could you tell me where they are? 5. "Clip the mountains above that ridge. It makes you being able to wallhack trough geometry of the map. A video of this can be obtained right here (the original demo can be taken here)." Thanks for mentioning that and even taking the effort to upload a demo. (Both links lead me to the .dmo, but nvm about that.) I clipped the mountains and also the top of the ridge since i actually dont want players getting there. 6. "The amount of playerstarts could be way more." True, I just added those playerstarts quite some time ago and I haven't about them anymore. I'll tweak the entire playerstart placement a bit and definitely add some more. I already started fixing some of the things you mentioned, but I'd like to make sure i got 2. and 4. before releasing an update. Excellent map. I will definitely include this. Very nice map, it's very non-linear, which keeps it interesting.